Make corporate Christmas cards and embellish them to get the professional and expensive look. Here are two business Christmas cards I created for established businesses. It is a good change to send handmade Christmas cards to your corporate clients but you'll need to make sure that the images are appropriate. In my opinion, trees, and wreaths are great images to use for these Christmas cards. The two business Christmas card designs I created used a Christmas tree rubber stamp by PSX and another a wreath stamp also by the same company. Here are the two cards. Have a look! 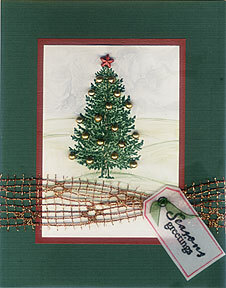 Click here to go to the step-by-step instructional page for this Christmas Tree Card. The card below is a wreath Christmas card. Like the Christmas tree card above, the card stock used are premium quality cards and the color scheme chosen are red and green; both traditional Christmas colors. Other colors to use for these cards are gold, silver, and blue. 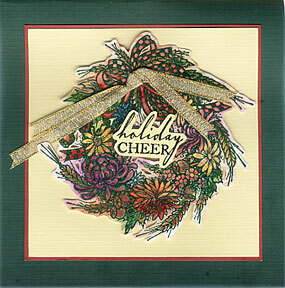 Click here to go to the instructional page for this Wreath Christmas Card. You also can refer to the Business Christmas Cards for some card making tips on making Christmas cards for business clients or associates. If you are a manicurist, beautician or hair stylist and own the shop, I suggest that you make some personal handmade cards for your most regular clients. It will certainly set you apart from your competitors or other small business owners. Take those down time to create festive cards. This way, you are making the most of your business hours and taking advantage of quiet hour(s). Also if you have employees, it is good fun creative time to bond and build relationship.